Oh BeeEss, Dan. You should take your act on the road and maybe visit O'Reilly or Hannity. Those guys love fantasy stories, especially about "Environmental groups." 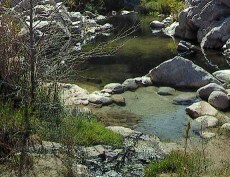 Have you ever walked the "goat trail" to the springs? The impact of boots, sandals/flipflops and bare feet on the terrain has altered it little in the 37 years I've hiked it. The recent illegal incursion of three dirt bike riders on that foot trail caused more erosion than the almost four decades of foot traffic that I've experienced. I have children and grandchildren who should have the opportunity to walk on wilderness lands unspoiled by vehicle noise and erosion now and in the future.